It’s been a while since I posted a “party” cake on the blog. I have been making cakes for friends and family for a while now, and a year working as a dessert chef has given me the confidence to try and turn my hobby into a proper business. My interests and skills lie in making really good homemade cakes, bread and desserts: home baking, essentially. For me, using fresh, natural ingredients to produce something that tastes delicious is key. If I’ve grown it, picked it or foraged it myself, even better. Which is a little at odds with some aspects of the cake making business. Novelty cakes are very fashionable at the moment and you can get a cake in any shape or form: the decoration being the most important element. You only have to watch the TV shows like “Cake Boss” to see that: no one ever mentions the cake or the filling, they are almost irrelevant. They literally treat them like bricks and mortar. There are some cakes that I know I can do justice to. I love decorating with chocolates and biscuits in particular: Malteser cakes, Oreo cakes, Ferrero Rocher and so on. Sugarpaste can be very versatile and I particularly like the way you can theme them with colours, animals, shapes, and so on. I love present cakes too: cakes that are decorated to look like one of your birthday presents: what a great present! On the other hand, if I tried to make a cake that looked like a handbag, for example, or a camera, I would struggle to create something that I would feel comfortable with. 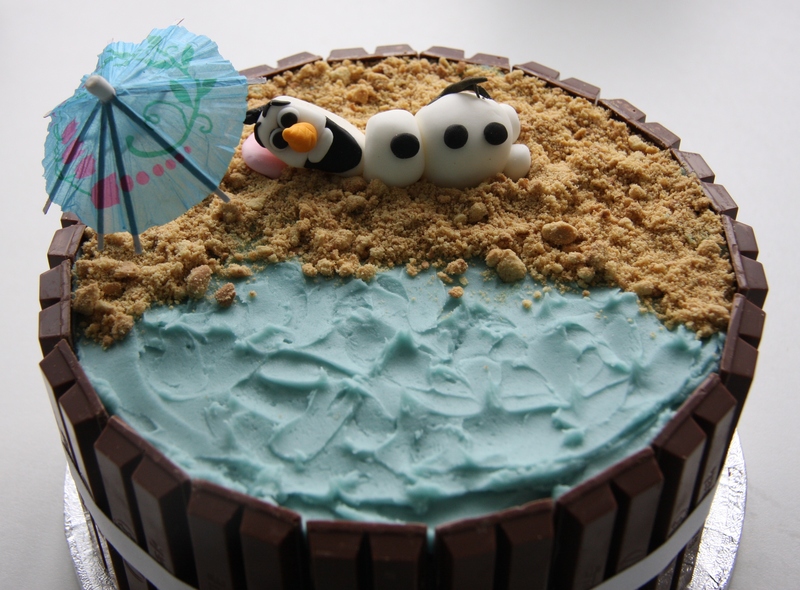 I thought twice about making an Olaf on the Beach cake when I was initially asked, but having managed a convincing Pigs in Mud Cake decided to take the plunge. As it were. My friend Trish sent me a photo of the cake her daughter wanted and I made her a three layer chocolate sponge cake, sandwiched with chocolate buttercream and edged with KitKats. I have no idea who came up with the original idea but there are lots of slightly different versions to be found online. 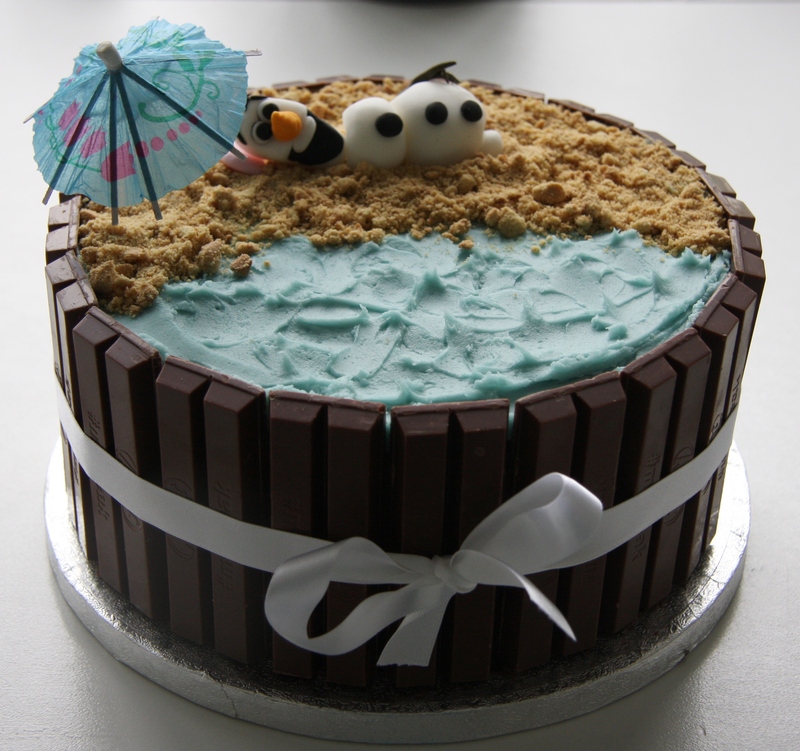 I used blue vanilla buttercream for the sea and the beach is made up of crushed digestive biscuits. 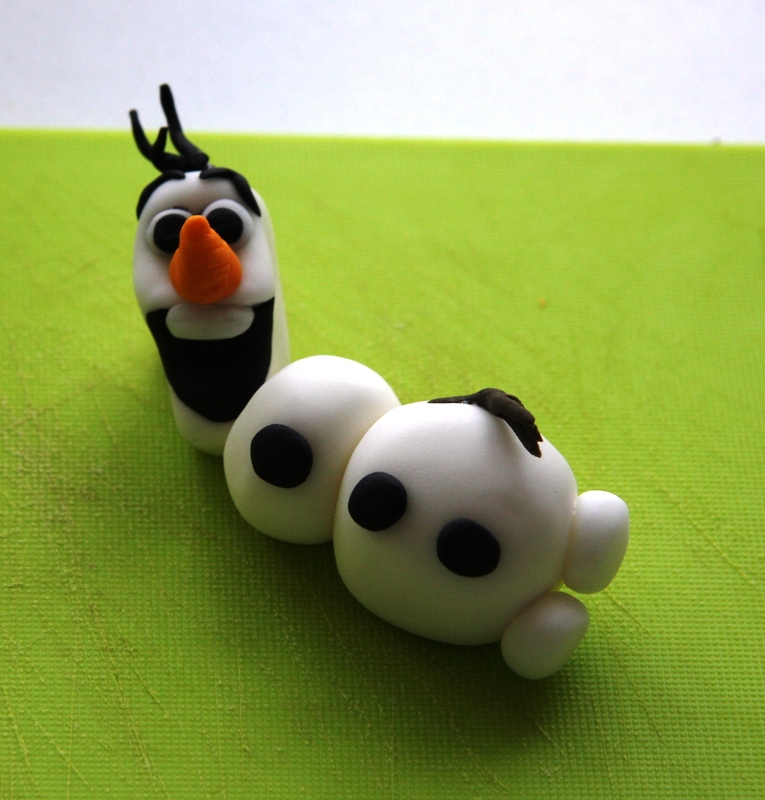 No wonder Olaf is in a good mood. 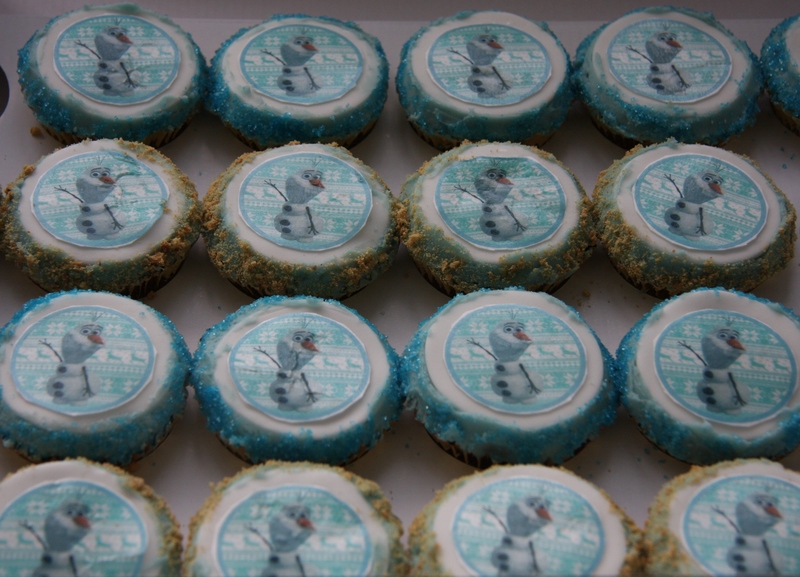 Trish also asked me for some cupcakes on the same theme for the take home party bags. 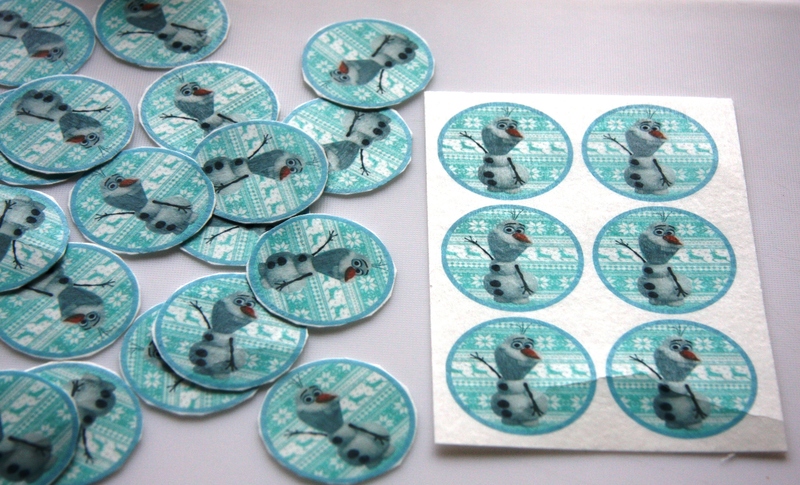 I found some rice paper Olaf cupcake toppers online and although they weren’t actually beach themed, they had the right colours to match. 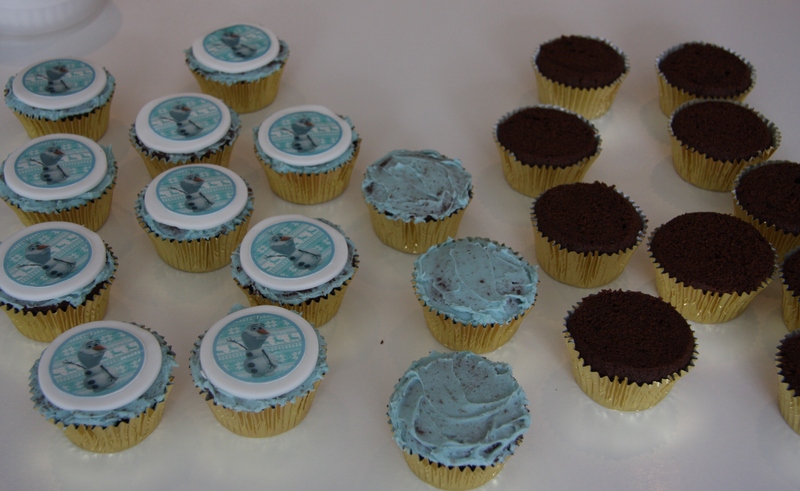 Rice paper cupcake toppers are designed to be applied straight onto sugarpaste or buttercream. 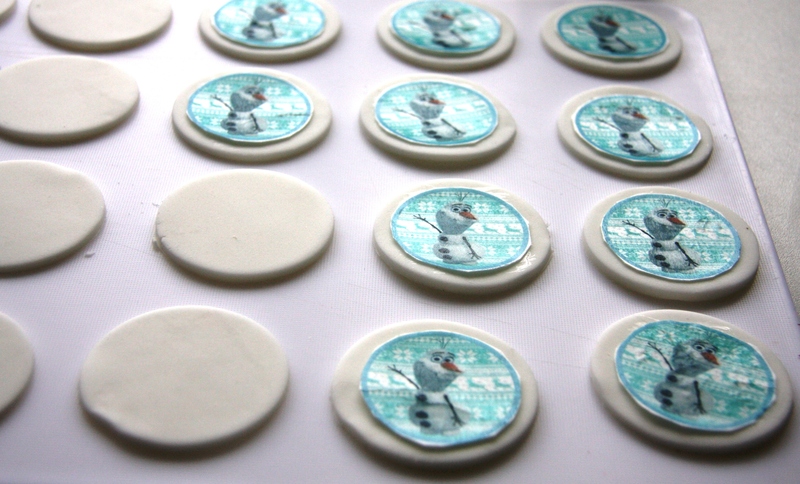 I like to cut sugarpaste discs and apply them like that. You can make the discs the same size as the cupcake but I wanted them slightly smaller so that I could use a border with them. Cupcakes are really fun to make and always look great all lined up together in their boxes. They make the perfect alternative to shop bought ones for party bags and in the unusual event that the children don’t want to eat them, you can be pretty sure they won’t go straight in the bin like most store-bought ones tend to: there will always be someone at home who will eat them! Although I make the same cakes a lot – carrot cake is particularly popular – there is also a lot of variety: last week I had Olaf and Pigs in Mud cupcakes and tomorrow I have two 12″ square lemon drizzle cakes to make. I chose the name lovinghomemade for my blog and that really sums up what I am trying to promote, both by trying to inspire people to bake themselves and with my baking as a business. I’m hoping there is a market out there for that! I lovce the “In Summer” song from the movie. This reminds me of it… sweet cake!! Thank you – I have to admit to never having seen the film!!! It’s a very sweet idea (shame it wasn’t mine!). Absolutely fabulous! And I agree with you about the cakes needing to taste good as well. Obviously the design and decoration is important but what’s the point if it isn’t also delicious? Thank you, I’m hoping more people think like you!